Meandering along one of the main tributaries of the Snoqualmie River for 12 miles, the Middle Fork Trail consists of a relatively gentle grade through beautiful scenery, punctuated by the sounds of the river’s peaceful babble. The trail is accessible from a couple of different trailheads and intersects with other paths along the way, giving you the flexibility to tailor your run to whatever length suits you. 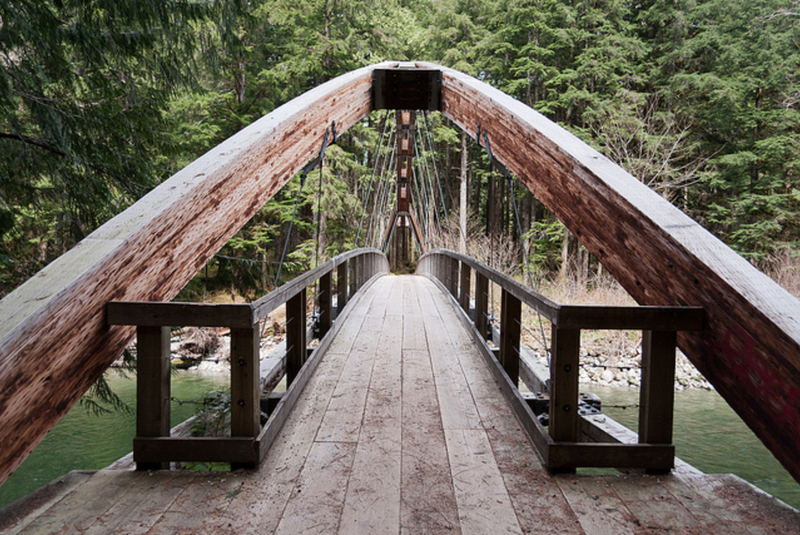 From the Middle Fork/Taylor River trailhead, begin by crossing the Gateway Bridge over the confluence of the Middle Fork Snoqualmie and Taylor Rivers. Continue running upstream along the river, between the water and some cool overhanging cliffs. 0.75-miles in the path curves away from the river and continues down an old logging road, a remnant from the North Bend Timber Company that hauled out a lot of the area’s trees during the 1920s and 1930s. 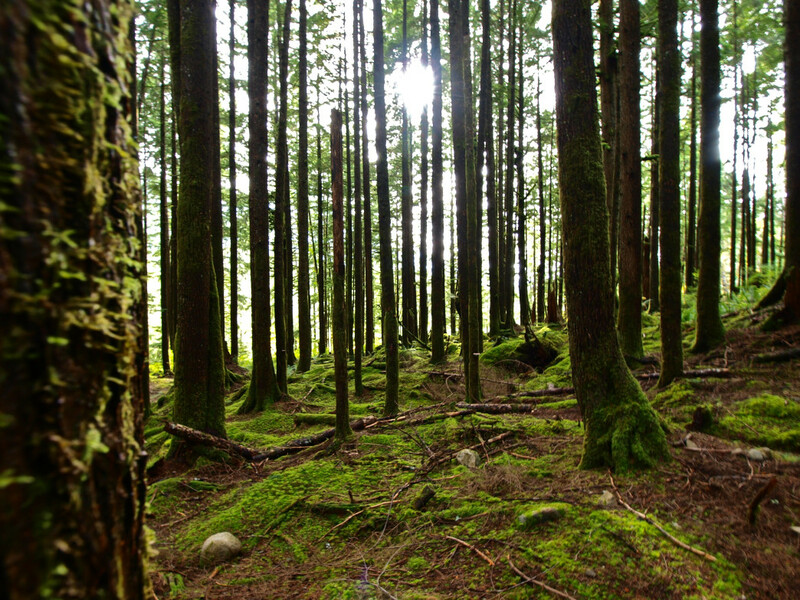 These days, most of the forest is mature second growth, but there are still some big old growth gems that remain. Three miles in, the trail then meets back up with the river, giving you a chance to catch your breath and explore its shores. The landscape will continue to treat you to handsome views as you carry on with your run, of Snoqualmie River’s snow-fed waters, of classic pacific northwest forests, and even glimpses of the impressive peaks that surround the Middle Fork Valley. At 5.8-miles, you will intersect with the Dingford Creek trailhead, which goes to Hester and Myrtle Lakes. This also makes for a good alternate place to start your run. At 8.5-miles, you will reach the fork with the trail to Snow, Gem, and Wildcat Lakes. Then, at 10.9 miles from the Middle Fork trailhead (about 5-miles from the Dingford Creek trailhead), you’ll reach the turnoff for a fantastic post-run treat: The Goldmyer Hot Springs. These privately owned pools are perhaps the best hot springs in Washington State. They limit the number of people that may enter on any given day, but you can make reservations in advanced here. You will feel so relaxed after your soak that it will likely be hard to muster the energy to run back to the car; factor in extra time to walk on the way back. Alternatively, continue the final 1.6-miles to the end of the trail. While the Middle Fork Trail itself is well maintained, the biggest difficulty of the day may be driving to where it starts. The road is notoriously full of potholes and mud; not the best destination for a typical sedan. However, major renovations are underway, as King County and Washington State are working to pave the nearly ten-mile road. In the meantime, this does mean frequent road closures until the summer of 2016. Check Goldmyer’s access report or the most recent newsletter from Western Federal Lands for up to date information. Anyone who likes the idea of soaking in natural hot springs after a good trail run. So, pretty much everyone who trail runs. The Middle Fork trailhead and parking lot is 11.8 miles down the Middle Fork Snoqualmie Road. For the Dingford Creek trailhead, pass the Middle Fork trailhead and turn right onto a gravel road immediately after crossing a concrete bridge. Continue for six miles.